The Women Entrepreneur Summit and Awards 2019, recognizes and celebrates exceptional women entrepreneurs who have moved all with their exemplary contribution, innovation, ideas and inspiration. The summit aims to felicitate women achievers and innovators who are constantly changing the face of Entrepreneurship in India for the better. This platform brings together the voices, success stories and insights from the leading women entrepreneurs from the diverse fields of business, who enable and empower women to become economically independent. 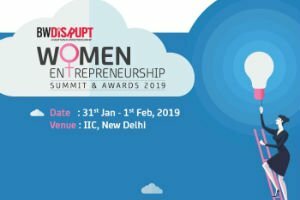 The Women Entrepreneur Summit and Awards is the first initiative by BW Businessworld Disrupt to bring together women leading women entrepreneurs, aspiring entrepreneurs, executives and professionals, change makers, mentor investors and government officials to share their inspiring stories, enabling others to reach new heights. The summit comprises of panel discussions, fireside chats with leading businesswomen, networking sessions and awards with an objective to create awareness and promote economic independence amongst Indian women. Tech is perceived to be the domain of men. However, of late, there have been several women who have started tech or tech-enabled businesses and taken them to success. The session will have a few successful women tech entrepreneurs speak about their journey – what made them embrace technology, the challenges they faced while adopting the technology, how they resolved the issues and their recommendations to other women who want to embrace tech or tech led businesses.